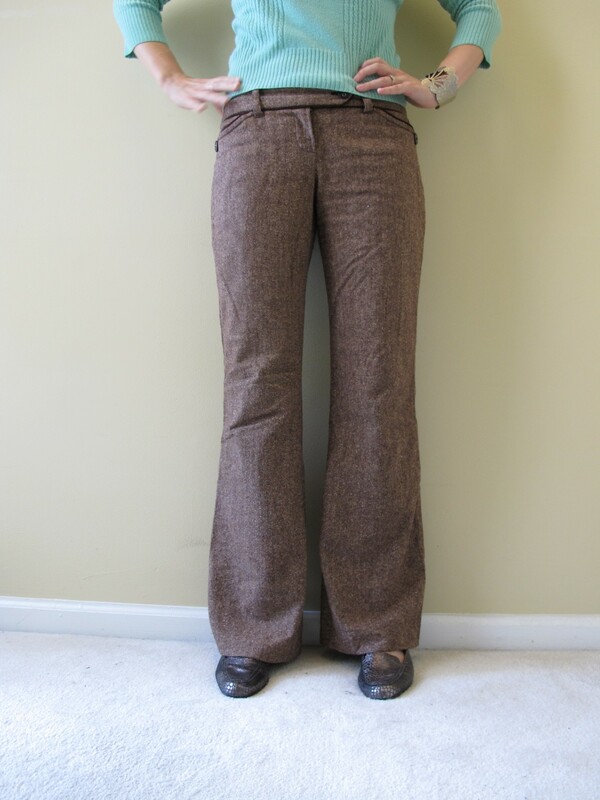 It’s Pants Week here at Thriftshop Chic. 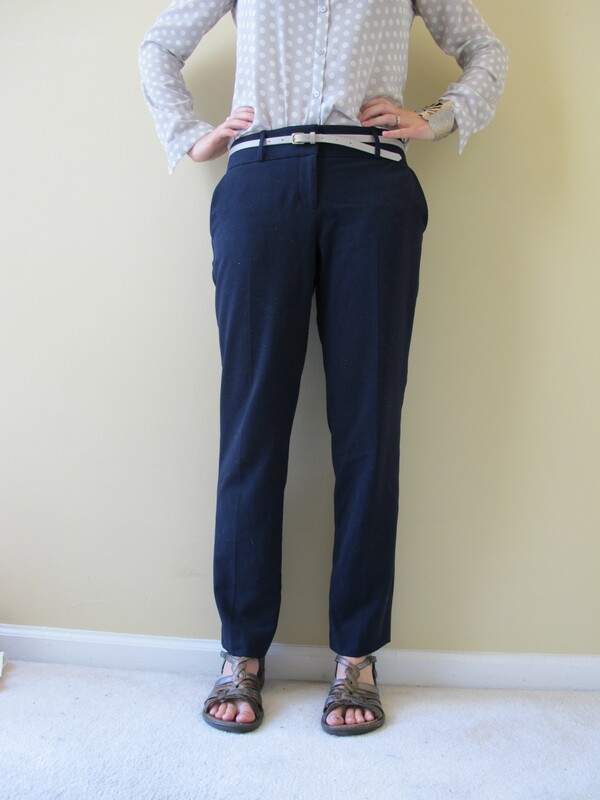 Today we take a peek into my pants MVPs (or, well, all my pants, since I try to make all my clothes clothes I love to wear); tomorrow, how to start your own pants capsule. I wear these babies with tucked in blouses, with tops that are more tailored, or with tops that are loose-fitting but on the slim side. The faded red goes with dove grey (as above), navies, whites, off-whites, and blushes quite easily; I imagine it’d go with camel, peach, and others as well. 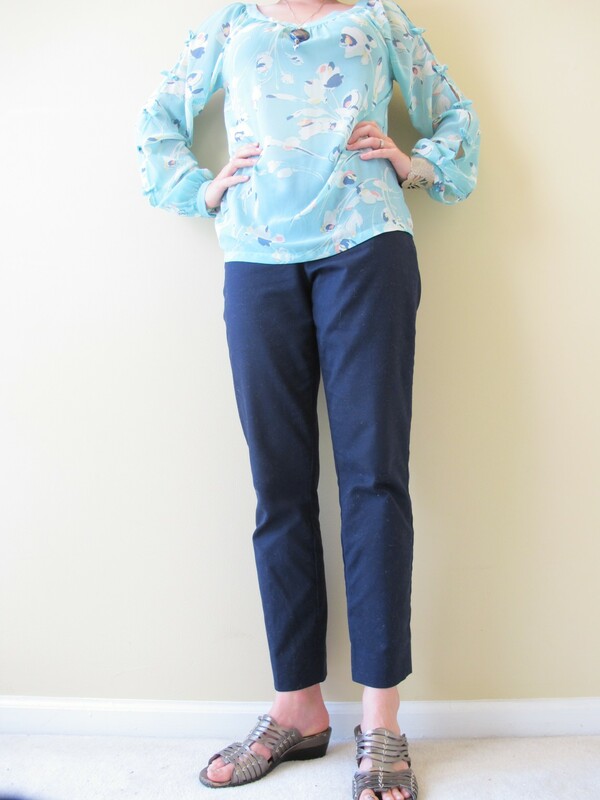 I always wear these pants with flats–floral sneaks, dress flats, or sandals as above–although they could probably work with an espadrille wedge or a casually-styled heel. These puppies are true white and therefore SO fresh in summer–and since they’re lined, they work well into September, too, since we’re not really following the rule about no white after Labor Day anymore. They go with navy, turquoise-y/teal, coral/red, camel, blush, and…just about everything, and although they’re a little loose for a really flowy shirt, they can handle tucked in and loose-but-slim tops like a pro. I do flats with these as well, although I think they’d look super chic with heels (I just don’t own any!). If you’re afraid of getting white pants dirty, don’t be–I keep a bucket and some oxygen-based cleaner in my laundry room and spot treat or soak whenever necessary (for me, that’s about every other wear). 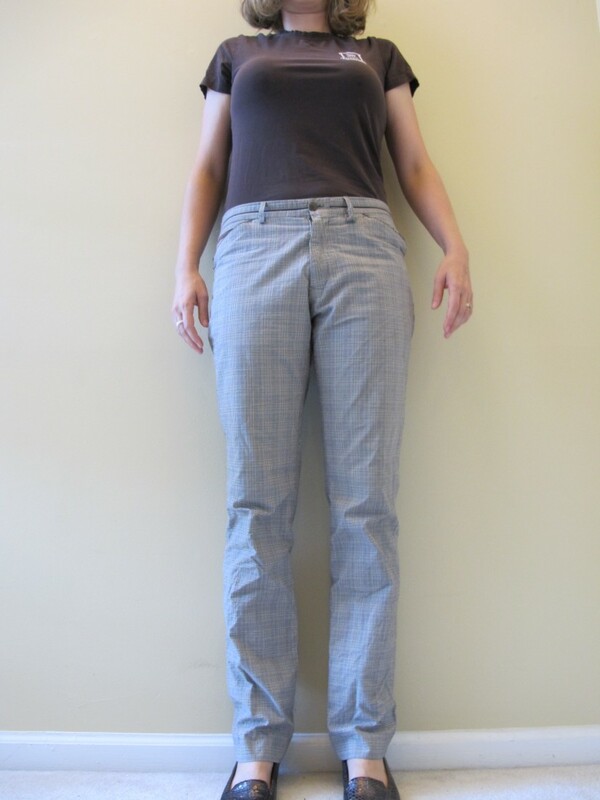 These are on the slimmer side–it does NOT look like it in these pictures, I realize, but the hips and thighs definitely bring it in more than my other warm weather pants, allowing for pairing with some looser tops. In navy they can handle all my red/blush/white/turquoise/teal/camel tops. (Pro tip: navy is a GREAT dark neutral if black is too harsh for your skin tone or your taste. *raises hand*) These are also cut a little shorter so wedges (ha, ^^that’s my idea of wedge!) and heels are perfect pairings. These are much looser in cut than the first 3 contestants. 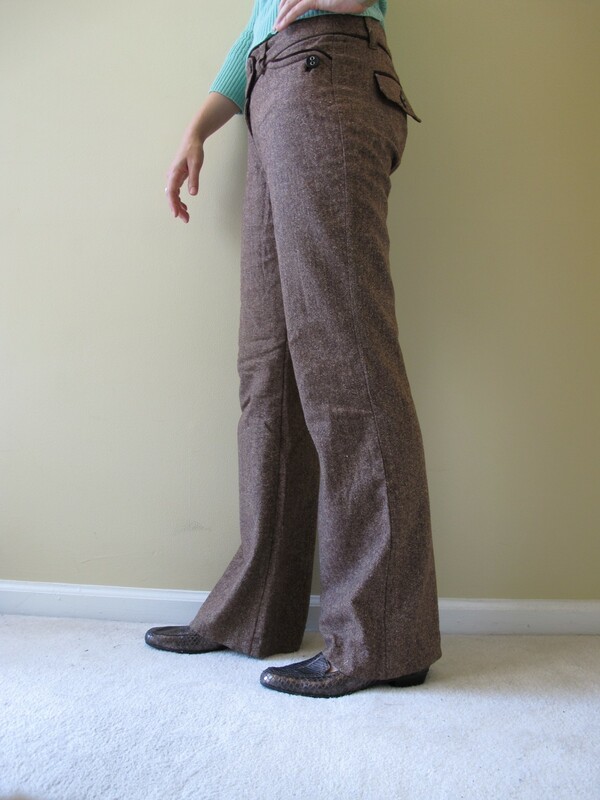 They drape in a trouser-y way–“trousers” to me spell fitted in the rear but relaxed down the leg, which these are. To balance out that drape, tailored or tucked-in tops are my go-to pairing. They aren’t lined but they are polyester, which means they don’t breathe as well; temp-wise, I actually have been wearing these recently because our office is air-conditioned, but I pay for it when I venture outside for more than 5 mintues. Shoes-wise, I think they go best with sneaks or dress flats but forgot to make the change for the photo. Their drape means they would probably accommodate boots, and they definitely have enough room for big thick knee socks come winter. These are indeed men’s pants; they were mis-organized in the women’s section and I benefited from the happy circumstance! They are nice and light but somehow don’t make it into my summer wardrobe…probably because the plaid makes me think of fall. The plaid has black and brown stripes, and the piping near the waist is a velvety brown; yet the overall effect of the plaid is a light grey, so they work as a neutral and wear well with black or brown shoes & belts. 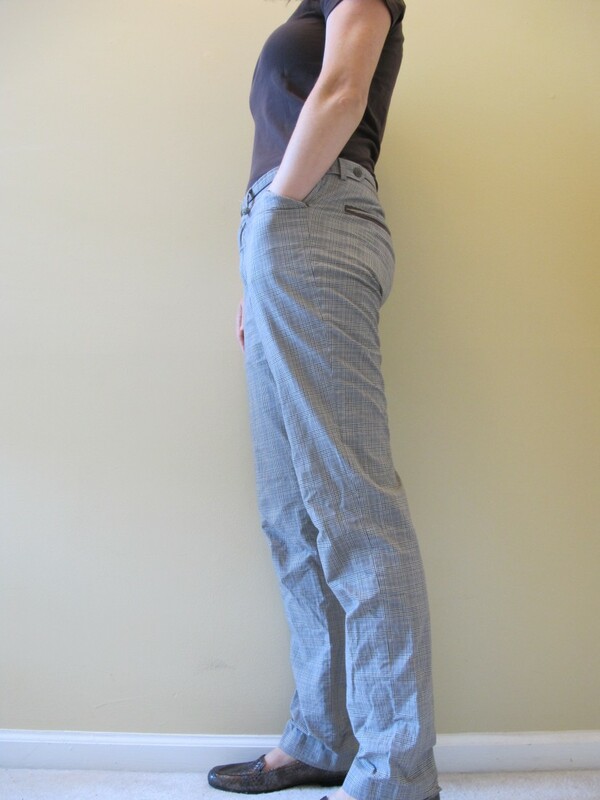 As a men’s-cut pant they have a higher waist and looser pelvic area, so I tend to wear them with closer-fitting tops. Also, these pants helped me discover that men’s pockets are GINORMOUS. It feels like my entire forearm has been swallowed by the pocket on the right, whereas women’s pockets are pathetic excuses for holding a chapstick (or they’re non-existent). Harrumph! I found these beauts in a thrift store somewhere in…Alabama? Mississippi? and knew they had to be mine. As you have probably deduced, they are way different from my typical cut, but I love the variety they bring to my wardrobe–I like to think they add a little unexpected sass. The sailor-style buttons are really kind to my mid-section and work best with tops that are fitted or straight but slim and that don’t venture too far below the waist–who wants to hide those glorious buttons?? The legs would probably work better with heels or substantial boots, but as I am an avowed afficianado of flats (learned from my mom who’s still paying for wearing heels for most of the 60s and 70s), I just make it work. The soft grey goes with my warm-toned sweaters and long-sleeved shirts as well as navy, blush, and winter whites. These are my only truly cold-weather pants–tweed and lined–which is just fine for Hotlanta, but I wish I could wear them all year round. The trousery-flare cut (don’t you love that jaunty little break in the right-hand photo?) is divine and I can.not.handle the piping on the pockets and waist (closeups once the weather cools down…November??). That piping highlights an area that is very kind to my rear and mid-section, and the tweed camouflages some spots that are starting to wear. I grabbed them out of a headed-to-donation-land pile at work 7 or 8 years ago and they always make me feel great when I put them on–a true sign of something that’s earned a place in your edited wardrobe. They work best with fitted or straight-but-slim tops, and dress flats or delicious brown leather boots (my black and grey thrifted cowboy boots clash, sadly). These go with everything. No, seriously. Following the principle of slow style, it’s taken me two or three years to build these pants together into a roster that covers all my bases (baseball pun intended). 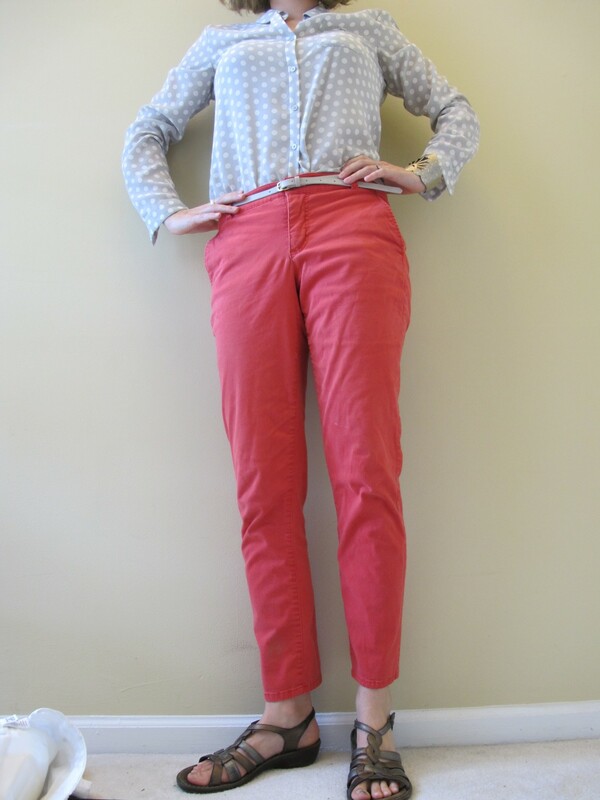 I made it work for a long time on just the colder weather pants and the red pants, but this season I decided that I wanted to wear pants more in the summer. Although I spent a few years with some unsatisfactory white jeans (didn’t wash clean, too tight in the waist, loved rolling the cuffs but not their flare style), this time I nailed the white pants on my first thrifting trip out. 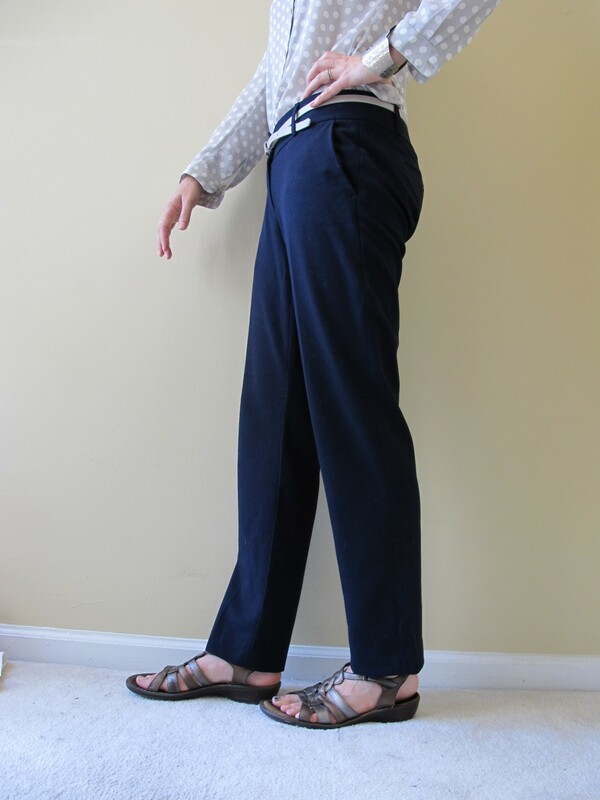 Carried away by my thrifting good fortune, on that same trip I misfired on some olive pants (uncomfortable, not versatile enough), and I took my sweet time finding both pairs of navy pants (as chronicled here). Assembling your pants lineup takes time whether you retail it or go the thrift route–you have to live in different styles, realize some are too uncomfortable or restricting for your everyday life, try out colors, etc. But once you get your team* together, it feels so good to own only pants you love and wear ALL the pants you own. Was this helpful? Are there any pants you would trash or treasure yourself? 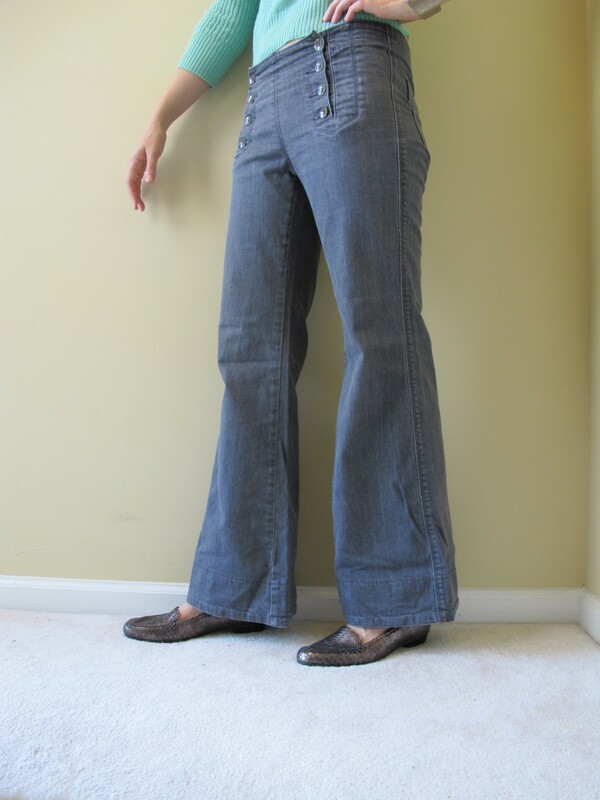 Looking to build your own thrifted pants capsule? Check back tomorrow for how to get started! *I apologize for all the bad sports metaphors in this post. Can I hire you to go through my wardrobe, then subsequently go thrifting? I need serious help. This is a great blog!! I thought I was the only thrift-obsessed person out there, so it’s nice to see these posts. Thanks so much for commenting! You are DEFINITELY not the only thrift-obsessed person out there…solidarity! I love finding good stuff for small price tags–found a Free People huge chunky cardigan for $6 at Goodwill the other day. And yes, NY has more expensive prices but definitely a better selection. I was thrilled 6 or 7 years ago when, on a trip to NYC, I got to peruse the Goodwill–some delicious finds. And I agree–thrifting is not only nicer on your wallet, it lets you play and be more creative! Let me know if there are any specific posts/topics you’d like me to cover, and thanks again for stopping by! I love your blog. Being plus size I don’t thrift for clothes any, because clothes are hard enough for me to find. I am loving your detail clothes info though! I am also so jealous of your pants variety. 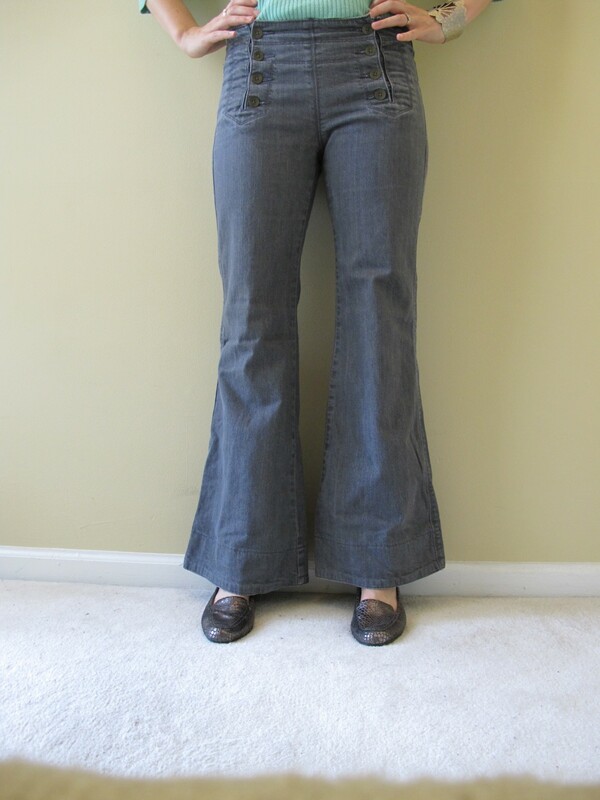 I had for the longest time jeans and work pants. One of my stores finally have pants I can wear with a better waist and I have several style jeans – somewhere in this house. Other pants it’s still just black pants for a interview/professional job. Check out my Instagram sidebar for some plus-sized options found at thrift stores. I agree, they are harder to find (unless like my sister you live near a specifically plus-sized thrift store–what?!? ), but there are some good finds if you know how to look. Shoes, bags, scarves, and other accessories are also good thrifting bets no matter your size.